Mike Ullery | Daily Call The Bradford Pumpkin Show Band parade makes its way down the street as the 90th anniversary Pumpkin Show gets under way on Tuesday. 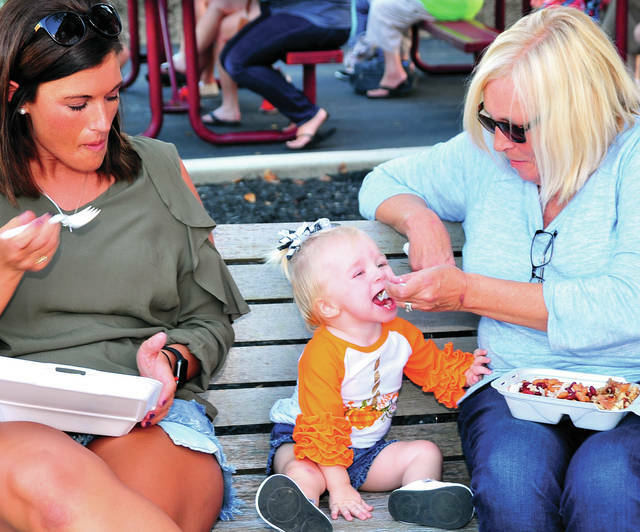 Mike Ullery | Daily Call Marissa Wirrig of Bradford, watches as Oakleigh Diehl, 15 months, enjoys a Pumpkin Show snack with a little help from her grandmother, Brenda Selanders, at Tuesday’s kick-off of the 90th annual Bradford Pumpkin Show. BRADFORD — The 90th annual Bradford Pumpkin Show kicked off its five days of festivities with family fun on Tuesday evening, holding the Pumpkin Diaper Derby and Pumpkin City Runs. “I think it went very well,” said Deb Wirrig, who co-chairs the Pumpkin Diaper Derby and Pumpkin City Runs with Brenda Selanders. The festival had 28 kids participate in the diaper derby and Pumpkin City runs. They also had eight babies participate in the diaper derby, so the event was split into two competitions plus one final competition in which the winners from the first two competitions faced off. “We have not had to do that for quite a while,” Wirrig said. The events saw a good turnout, with a range of visitors and locals in addition to clear, warm weather on Tuesday evening. Wirrig also co-chairs the Cutest Baby Contest, which also has 28 participants and will be going on all week. The baby pictures will be on display in front of the municipal building, where attendees can vote on the cutest baby by giving monetary donations. From those donations, 25 percent will be donated to Dayton Children’s Hospital, Wirrig said. The winners from the Cutest Baby Contest will be announced at 2 p.m. Saturday. Aria Canan, an 11-month-old from Covington, placed first in the diaper derby in the 3 to 12 months category. Her mother, Heather, said it was “awesome,” and her father, Derrick, said it was fun watching his daughter participate. Nine-month-old Stella Francis also participated in the diaper derby with parents Tyler and Jessica cheering her on. Tyler Francis said that they come out to the Pumpkin Show to enjoy time with the kids, including their other daughter, Adeline, who is now 4 years old and was 11 months old when she participated in the diaper derby. Caleb Pennington of Springfield placed first in the 18-to-23-month-old category in one of the Pumpkin City Runs. “We come every year,” said his mother, Hannah, who is originally from Bradford. The midway and rides will be open from 4-10 p.m. on Wednesday. The Little Miss and Master Pumpkin Contest will be held at 4:30 p.m. 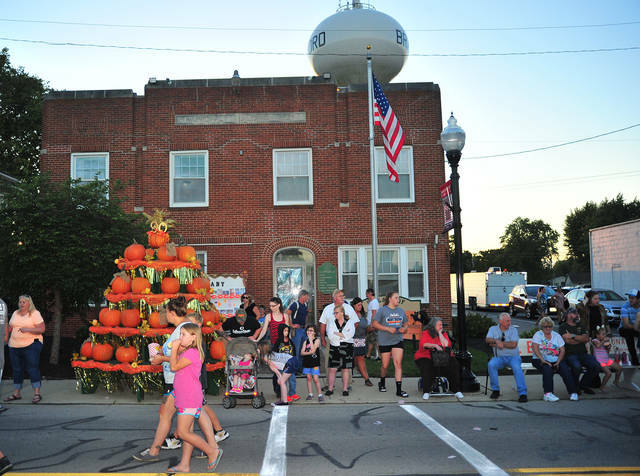 The parade will be held at 7 p.m., with the Miss Pumpkin Queen Contest being held immediately following the parade on the north end stage. There will be no confetti on Wednesday evening. On Thursday, the midway and rides will be open from 4-10 p.m. The Kiddie Tractor Pull will be held at 4:30 p.m. The parade will be held at 7 p.m., with the cheerleading competition being held immediately afterward. On Friday, the midway is open from 1-11 p.m. The school parade will be held at 1:30 p.m. 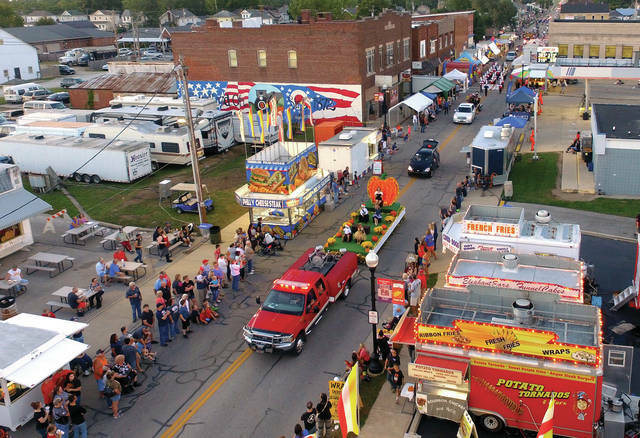 The Big Wheel Contest will be held at 4:30 p.m. Spittin’ Image will perform on the north end stage at 8 p.m.
On Saturday, the midway will be open from 10 a.m. to 11 p.m. At 8 a.m., there will be a 5K race around Bradford. There will be a car show from 9 a.m. to 3 p.m.
A craft show will open at noon at the south end of the midway. Also at noon, there will be a Pet and Novelty Parade. The Cutest Baby Contest will be held at 2 p.m. Judging and lineup begin at 1:30 p.m. The Extravaganza Parade will be held at 4 p.m. Also at the north end stage, Smash-a-Pumpkin will be held at 5 p.m. and the Lucky Pumpkin Sweepstakes will be held at 10 p.m. Tickets for those two events will be on sale all week. For more details, including a map of the midway and surrounding area, visit www.bradfordpumpkinshow.org. https://www.dailycall.com/wp-content/uploads/sites/30/2018/10/web1_100918mju_pumpkinshow1.jpgMike Ullery | Daily Call The Bradford Pumpkin Show Band parade makes its way down the street as the 90th anniversary Pumpkin Show gets under way on Tuesday. https://www.dailycall.com/wp-content/uploads/sites/30/2018/10/web1_100918mju_pumpkinshow2.jpgMike Ullery | Daily Call Marissa Wirrig of Bradford, watches as Oakleigh Diehl, 15 months, enjoys a Pumpkin Show snack with a little help from her grandmother, Brenda Selanders, at Tuesday’s kick-off of the 90th annual Bradford Pumpkin Show.